Strong Results in the January Sale. 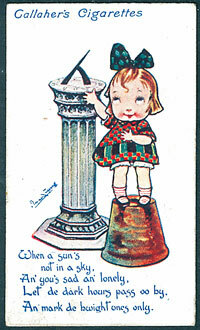 The first part of the cigarette card section contained several larger collections and mixed lots with many realising figures well above estimate. A lot containing part sets from Gallaher, Ogden and Smith estimated at £250 realised £480. Another lot featuring a range of Australian part sets estimated at £150 realised £400, another small lot of part sets from Churchman, Cope, Hill and others estimated £120 made £236 and a collection of Ogden Guinea Gold cards estimated at £200 fetched £507. 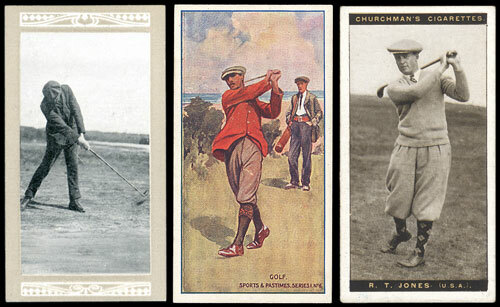 The best results of the day were again achieved by the Golfing and other sport sets, including a set of Churchman Famous Golfers making £295 and Marsuma Famous Golfers & Their Strokes set estimated at £500 realising £620. 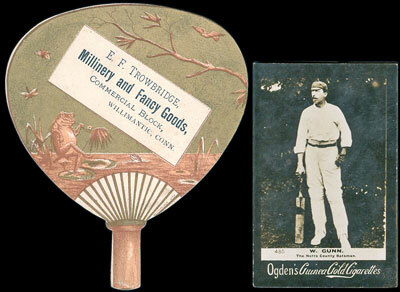 There was also a Taddy Sports & Pastimes set on offer which realised £260 and a Wills Cricketer Series 1901 with vignettes set (less 6) estimated at £220 which made £260. Other individual sets in the sale also achieved good results with many exceeding their estimates. Some notable examples include a set of Carrick Military Terms with an estimate of £200 fetching £236, a set of Harvey & Davy Birds & Eggs estimated £70 achieved £106, a Lambert & Butler Motors set estimated at £150 made £188, an England’s Naval Heroes (descriptive, narrow) set estimated at £120 made £188, a Smith Battlefields of Great Britain set with an estimate of £200 realised £260 and Taddy Royalty Series set with an estimate of £130 fetched £188.